Cooling fans inside the computer bring in dust. Over time, this dust accumulates and interferes with hardware performance. If the computer is still under warranty take advantage of the warranty and have the manufacturer service clean it. If not, take these steps to perform cleaning yourself. Collect the necessary supplies to perform the physical computer maintenance. These are suggestions and some can be replaced with other methods. An anti-static wristband – This is to prevent any static discharges from the human body from reaching the hardware. Static charges can ruin hardware instantly and are easily avoidable. Compressed Air- A can of compressed air is used to blow the dust out of those hard to reach areas. Toothbrush – This will be used to clean fans and other areas that a damp cloth cannot reach. Mask – Allergies can act up when cleaning the dust out of a computer. Plug the computer into a surge protector if not already in one. This ensures that the computer is grounded and electrical charges will go into the ground instead of the hardware. Disconnect all devices: mouse, keyboard, monitor, printer, joystick, etc… All that should be left plugged in is the power cable. Open the case – Depending on the manufacturer, the case might open by sliding off a side, holding pressure clamps to release the case, or by unscrewing a door. Check the manual to see if there are any specific instructions. Ground yourself with the anti-static wristband or other grounding method. Touching a metal part of the case structure is also a good way to ground yourself. 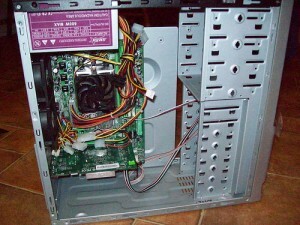 Begin physical computer maintenance by locating the fans and spray the compressed air to dislodge the dust. Any dust that does not come off with the compressed air, brush off with the toothbrush. Spray the rest of the computer’s insides with the compressed air. Be careful that dust does not fly up and enter your eyes. Continue to remove dust until satisfied. If any hardware was removed to aid in cleaning put it back and connect any wires that might have been unplugged. Replace the case door and replace any screws (if any). Turn the computer on to make sure all hardware is working properly. When performing this computer maintenance make sure to work on a hard surface. Carpet should be avoided due to the greater possibility of creating static and interfere with your CPU. Touch the computers hardware as little as possible. It might be a good idea to have a vacuum ready to collect any dust that is collected from the cleaning. Computer cleaning is a very simple task when the proper tools are available. Computer cleaning tips such as the ones listed above should be a guideline for general physical computer maintenance and can keep vital hardware like your hard drive and RAM working optimized. ‹ What is SMTP and POP3?